1. Cut the top off the hard-boiled egg and scoup the yolks out into a bowl. 2. Mash the yolks with a fork and add the mayonnaise, curry powder, mustard, salt and pepper. 3. Stir until smooth, add more mayonnaise if it looks a little dry. 4. Spoon the mixture into a piping bag and pipe the mixture into each empty egg. 5. Place the tops back on the eggs and decorate. 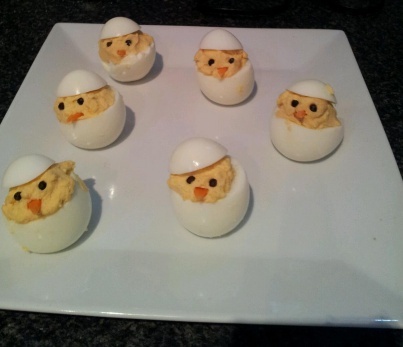 Can use your favourite Deviled Egg recipe to make these.